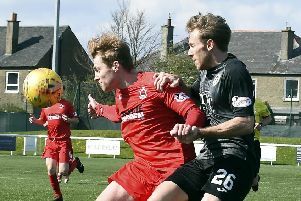 Edinburgh City striker Scott Shepherd insists Falkirk’s defeat of Inverness on Saturday couldn’t have come at a better time as the Capital side prepared to head north for their William Hill Scottish Cup third-round replay tonight. The Highlanders had been on a remarkable run and, prior to the weekend’s 3-2 defeat at the Tulloch Caledonian Stadium, hadn’t lost a Championship fixture since James Craigen’s winner for Dunfermline in March. John Robertson’s men had come unstuck in Betfred Cup and Irn-Bru Cup fixtures this season, however those setbacks were in July and August respectively. City haven’t been on a bad run themselves and currently lead the way in Ladbrokes League Two. The Citizens also have an Irn-Bru Cup semi-final clash against Welsh outfit Connah’s Quay Nomads in February. Shepherd, who scored the second goal in Saturday’s 2-0 win over Queen’s Park to maintain City’s two-point lead over nearer challengers Peterhead, believes tonight’s replay is an ideal opportunity to spring a shock. The two teams could not be separated at Ainslie Park ten days ago, Liam Henderson’s scrambled effort cancelling out a Shaun Rooney header six minutes before the interval to give City boss James McDonaugh reason to praise the character of his players. Ahead of the trip north, Shepherd, 22, said: “It would be brilliant if we could inflict another defeat on Inverness tonight. We just need to apply ourselves. It’s a ground I’ve played at a few times. “It’s a big pitch so I’m looking forward to it. I like playing on the grass so it will be a nice change from artificial. “It’s funny that you can go on these runs where it’s so long without a defeat and then another one comes along in quick succession. That will definitely be our aim tonight. “Their confidence might have taken a wee bit of a hit but they’ll be wanting to bounce back and get a result. “I don’t think it matters who you are playing when you’re coming off the back of a defeat, you just want to get back to winning ways. We just need to be ready for that and be prepared. They’re two divisions above us so the pressure is all on them to get a result. They’re well organised and you know it will be difficult to break them down. With a home tie against East Kilbride the incentive for tonight’s teams, Shepherd added: “We know what the prize is for winning the tie.